Donald Trump's marriage to Melania Knavs, a Slovenian-born former model, was the subject of public scrutiny long before he moved into the White House. The power couple has dealt with everything from public lawsuits to accusations of gold digging and infidelity. When "The Donald" finally pulled the trigger on his oft-discussed presidential run, the spotlight on their relationship intensified. 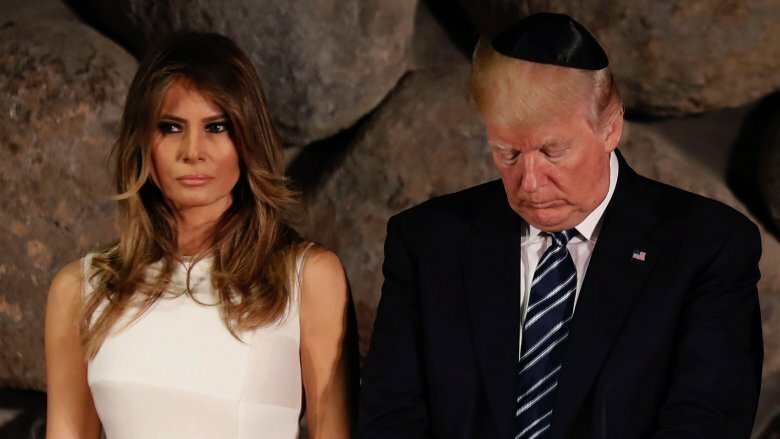 Only time will tell if Donald and Melania's marriage can withstand such public scrutiny, but let's take a closer look at what's really going on. In May 2017, President Trump embarked on his first foreign visit since taking office, and the trip produced so many viral moments, social media could barely keep up. There was the much-memed glowing orb, the questionable bow, and the awkward sword dance, but none of those moments come close to "the swat" seen 'round the world. Upon arriving direct from Saudi Arabia to Israel, President Trump attempted to take the first lady's hand while they were walking down the tarmac. Melania clearly swatted away the president's paw, apparently unaware of the approximately 10 million cameras pointed in her general direction. Oof. The Daily Beast reminded us that Melania also refused to hold Trump's hand when they arrived in Washington, D.C. for the inauguration. Is she trying to tell us something, or is she just not into middle-school PDA? Do they protest too much? Given enough time, even the most perfect couple will eventually have a fight, but according to the Trumps, this has never happened to them. "We don't have fights. 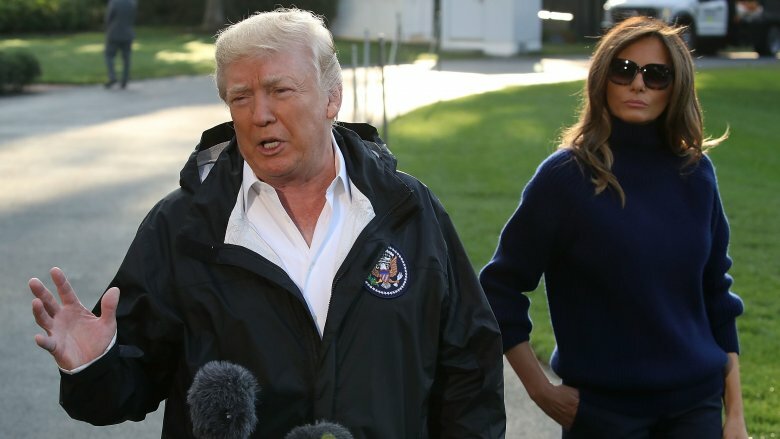 We disagree, but that's OK. That's very good in the relationship," Melania said during an interview with journalist Greta van Susteren (via The Huffington Post). Donald echoed that claim to talk show host Larry King. "We literally have never had an argument; forget about the word 'fight.' We never even had an argument. We just are very compatible. We get along," he said. It's impossible for anyone outside the marriage to know if this is true, but Donald's long history of public feuds—particularly with his two ex-wives—makes this claim all the more dubious. In January of 2000, Donald confirmed to The New York Times that he and Melania had split, and he did it in the most Donald Trump way possible: surrounded by models at a Miss U.S.A pageant party. Melania later admitted to DuJour that the break was partially due to Donald considering running for president. "That was part of it. We were apart for a few months, not long. We got back together," she said. The aforementioned episode was actually their second split. According to Melania's friend and former roommate, fashion photographer Matthew Atanian, Donald and Melania had a falling out very early in their relationship. "She had some trust issues with him at the beginning … She kept her apartment to have her own space because of this," Atanian said. 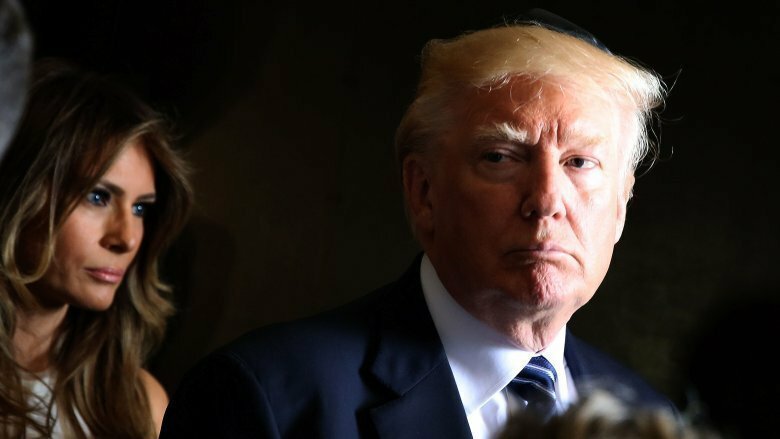 They only stayed apart for a few months, but if accusations of infidelity and Donald's political aspirations are still any kind of sticking point, this couple may be in for a rocky road ahead. There have been multiple occasions where Melania has found herself trying to explain away her husband's unsavory comments. There was, of course, the time when she released a statement to denounce his infamous Access Hollywood scandal: "The words my husband used are unacceptable and offensive to me. This does not represent the man that I know." Melania has also addressed Donald's conversations about their love life and her pregnant body. According to Cosmopolitan, Donald told shock jock Howard Stern on-air that pregnant women "just blow up … like a blimp — in the right places." He added, "I mean she really has become a monster — in all the right places. I mean monster in the most positive way. She has gotten very, very large — in all the right places." According to Melania, that interview wasn't her husband's fault. She told Fox News (via Politico) that others are just good at egging him on. But that's really just the tip of the iceberg when it comes to Trump's chats with the so-called King of all Media. In September 2017, recordings from multiple interviews with Stern were published on Factbase (via Independent), revealing a slew of "locker room" style conversations between the future president and radio star. So, are we still supposed to believe the whole "we never fight" thing? You've seen that GIF that tore across the internet on the day of the inauguration ceremony — the one in which Melania smiles sweetly when Donald turns to look at her, only to instantly transform when he turns back around. That was just one of many bizarre couple moments that occurred that day. There was also their awkward dancing at the inaugural ball. 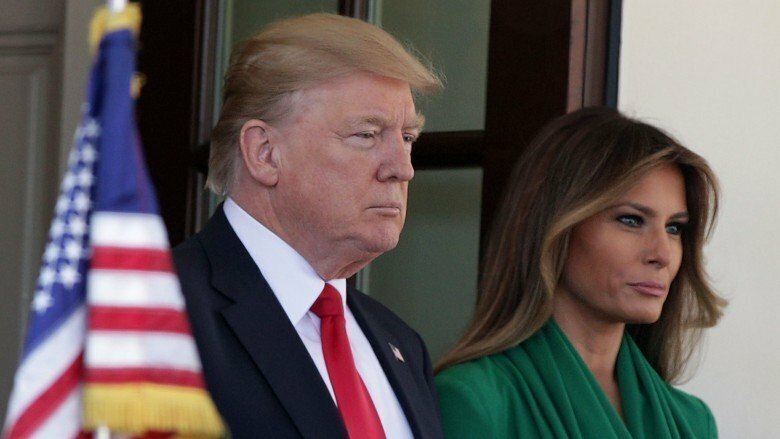 Melania seemed to be leaning away from Donald, a move one body language expert claimed could be interpreted as the first lady signaling, "I don't want to merge with you as a partner." And, of course, probably the biggest "WTF!" moment was when they arrived at the White House to be greeted by the Obamas. 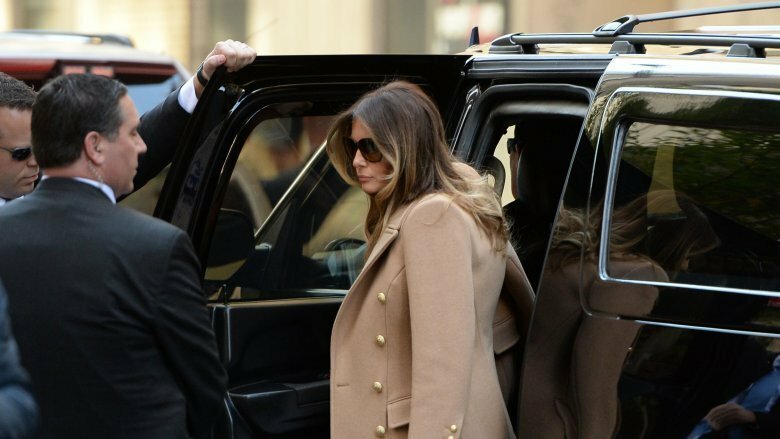 Trump bounded out of the car and went right up the steps, leaving Melania to walk around the back of the vehicle and up the steps on her own. This was the first impression the new POTUS and FLOTUS made to the millions watching at home. While each incident can easily be chalked up to nervousness, some serious questions about their relationship have emerged. The trend of media outlets hiring body language experts didn't stop with the inauguration. 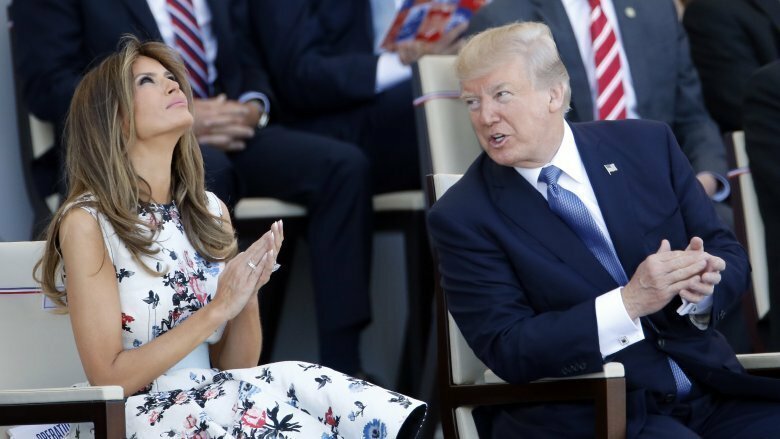 In fact, almost every time the president and first lady appear in public, you can count on a fresh round of experts being trotted out to analyze everything from the distance they stand apart from each other to the subtle ways they move. 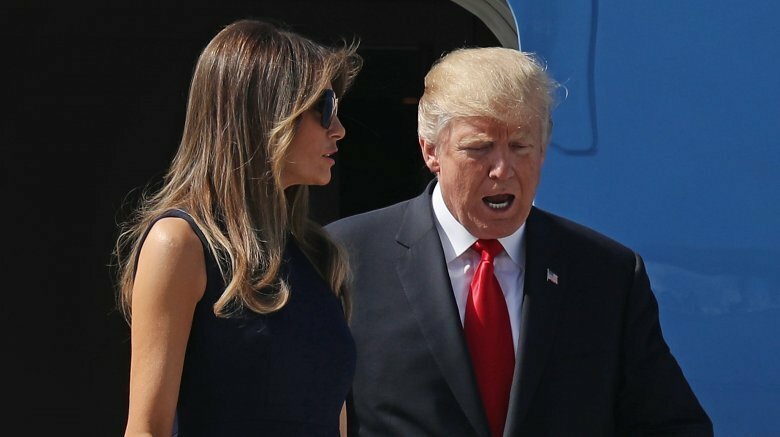 Interpreting how Melania reacts, or doesn't react, to Donald has become its own cottage industry, even though it sometimes yields contrasting conclusions. 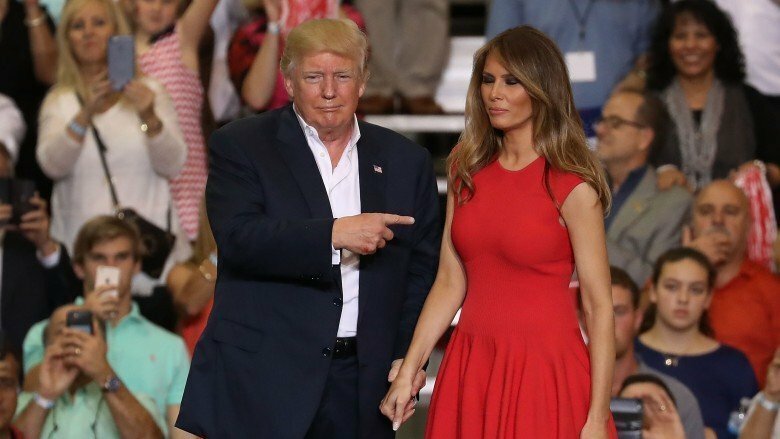 For example, in Elite Daily coverage of a February 2017 rally during which Melania appears to flinch when Donald touches her arm, the outlet calls on two body language experts to get to the bottom of her uncomfortable reaction. The first expert concludes that Melania was merely nervous about giving a speech, while the second expert makes the leap that "There is no love there." So there you have it. Melania is either an awkward public speaker or she hates the sight, sound, and touch of her own husband. Glad the ironclad science of body-language analysis could clear that up for us. Is theirs a marriage of convenience? According to Vanity Fair, Donald met Melania in 1998 at a party he attended with another date, Norwegian cosmetics heiress Celina Midelfart. While Midlefart was in the bathroom, Donald reportedly gave Melania his number, and they connected a few days later. Sources allege the match was very convenient. Donald got an attractive younger woman with the traditional values and independence he was looking for, and Melania, who is about 24 years his junior, may have spotted some big perks too. "She ran into Donald just at the right time. She was just about out of money, at the end of her rope and about to move back to Eastern Europe," a source told the New York Post. What would you say 'you do' here? Melania is one of the few first ladies in the history of the presidency to delay moving into the White House. 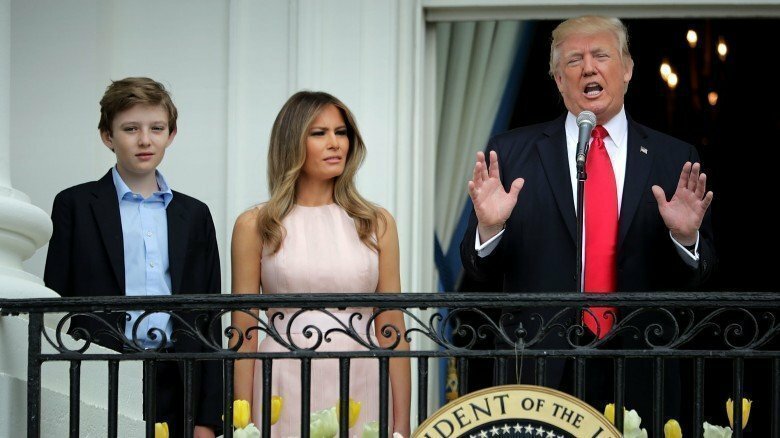 The Trumps made it clear they wanted their son, Barron, to be able to finish school in New York without interruption, yet questions remain about the level of involvement Melania will assume in the East Wing. Back in 1999, Melania had a much different vision for her theoretical role as FLOTUS: "I would be very traditional. Like Betty Ford or Jackie Kennedy. I would support him," she told The New York Times. Seventeen years later, Melania drastically changed her tune, telling GQ, "I chose not to go into politics and policy. Those policies are my husband's job." Her position changed again just days before the election, when she announced that one of her key issues as first lady would be to combat cyber-bullying, which many found ironic considering Donald's penchant for slinging barbs via Twitter. Scrutiny over Melania's role as FLOTUS intensified after Donald's daughter, Ivanka Trump, assumed an official role as special adviser to the president, creating much speculation that Ivanka could be the one performing duties typically reserved for the first lady. That assessment shifted again during Donald's first official overseas trip. Melania accompanied him, and, according to many accounts, salvaged what could have been a diplomatic disaster. 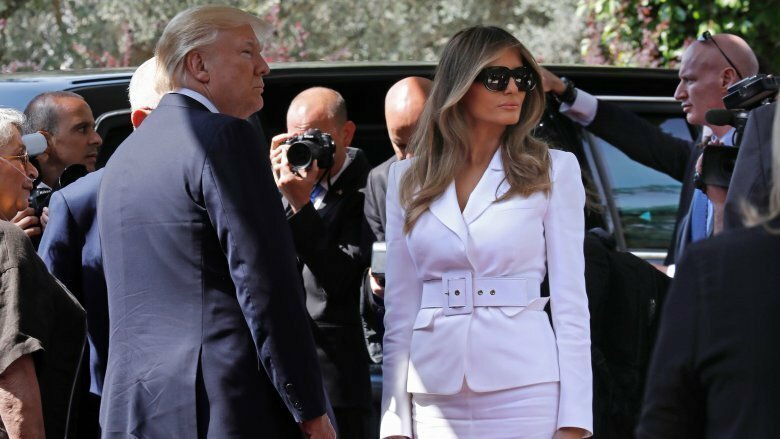 Aside from the aforementioned hand-holding snub, Melania essentially stole the entire international show, charming Pope Francis with small talk and making headlines with her fashion choices. Of her performance during the trip, Donald himself was reportedly overheard aboard Air Force One describing her as "Jackie O on steroids." We already mentioned how Melania put off her move to Washington, D.C., but it should also be noted that the effort and expense involved in doing so has raised eyebrows. 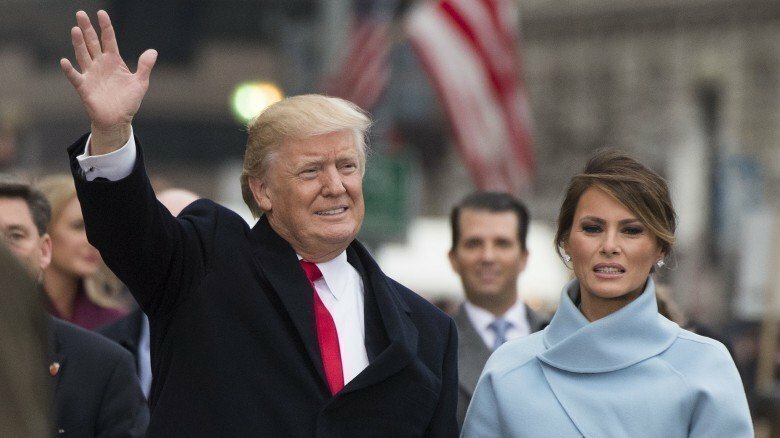 According to The Hill, it costs "between $127,000 and $146,000 a day for the New York Police Department (NYPD) to protect [Melania] and her son," which resulted in a total cost of $24 million between Election Day and Inauguration Day alone, according to NYPD officials. 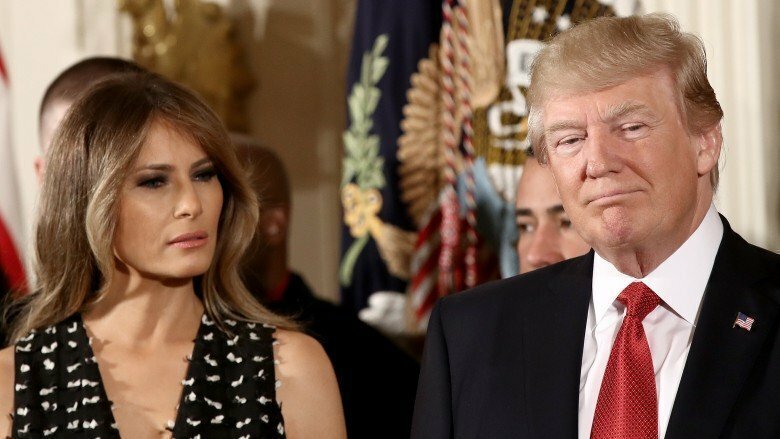 Public outcry over the exorbitant expense prompted a change.org petition demanding FLOTUS either move to the White House or foot her own security bill. Have they heard of Sleep Number? We admit this one has to be viewed as pure speculation, but in light of all the other obvious weirdness in the Trumps' marriage, we're willing to consider the relatively benign claim that they don't share a bed, which is, honestly, a pretty common practice among many couples. Anyway, according to "multiple sources" for Us Weekly, Melania "refuses to share a bed with Donald even on the rare occasions when they sleep in the same city." One insider described the practice as being "very royal of them," in an obvious attempt to put a positive spin on the story. We're giving this one a 50/50 chance for accuracy because who knows? Maybe President Trump's snoring sounds like a chainsaw being thrown into a wood chipper, or maybe his luxurious hair tickles Melania's nose and keeps her up all night. Part of Melania's independence apparently includes fielding most of the parenting responsibilities to raise Barron. "He didn't change diapers and I am completely fine with that. It is not important to me. It's all about what works for you. It's very important to know the person you're with. And we know our roles. I didn't want him to change the diapers or put Barron to bed. I love every minute of it," she told Parenting. It's not as if Melania was blindsided by Donald's "relaxed" attitude toward being a dad. In 2005, pre-Barron, the real estate mogul sat next to his new bride on Larry King Live and said, "Look, Larry, the way I look at it, there's nothing like a good marriage and there's nothing like having children. I have four great children. If you have the money, having children is great. Now, I know Melania. I'm not going to be doing the diapers. I'm not going to be making the food. I may never even see the kids. She will be an unbelievable mother. I'll be a good father." 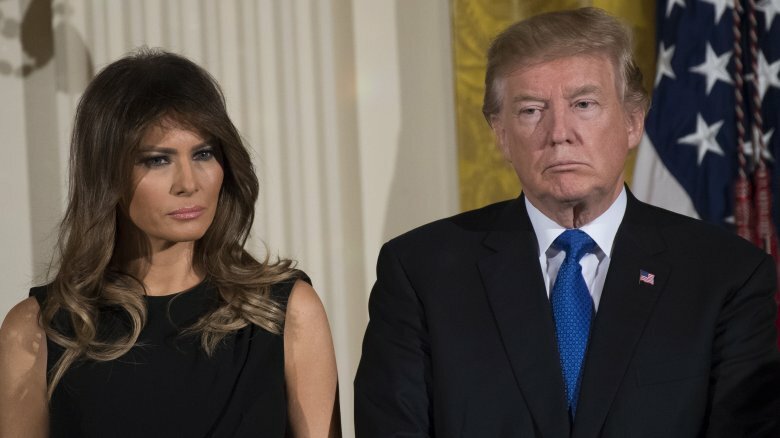 It is clear that Melania is willing to stand up for her husband, even in the face of some of his more disturbing controversies, but in the case of People reporter Natasha Stoynoff's accusations of sexual assault against Donald, Melania's defense left some big questions unanswered. Stoynoff alleged that in 2005, she was interviewing the Trumps when a then-pregnant Melania left her alone with Donald. Stoynoff says he pushed her against a wall and shoved his tongue down her throat. According to Vanity Fair, Melania's response to the awful claim focused on a minor detail in Stoynoff's story and did not confirm or deny the rest. Stoynoff claims she bumped into Melania a few months later, but Melania's lawyer issued a statement refuting that second encounter. Did Melania decline to comment on the rest of the story because she believed the alleged assault happened, or did she simply not have the legal grounds to discuss it since she wasn't in the room at the time? Either conclusion potentially speaks volumes about Melania's responses to her husband's controversies. Former Mar-a-Lago butler Anthony Senecal may have inadvertently given us a peek behind the carefully managed curtain that is the Trump marriage when he tried to pay a compliment to Melania. Senecal told The Washington Post that Melania "could be personable in ways the public rarely sees." He then shared an anecdote about how she "urged him to take time off to visit his dying sister." Senecal also claims Melania added one important caveat. "When Donald's here, you'll have to stay," she allegedly said. He described her personality as warmth "masked by a restrained veneer." If Senecal's story is true, it suggests Melania may be stifling her true personality to appease Donald. Granted, these are the claims of a former employee, and hey, if it works for her, who are we to say she's unhappy? This is probably the weirdest item on this list, and it's courtesy of a GQ profile that boldly dug up dirt on Viktor Knavs, Melania's dad. GQ discovered that Knavs is only five years older than Donald and actually bears a resemblance to him in both looks and attire. "He likes quality," Melania said of her dad, who wore "sharp suits" and had "an extensive collection of Mercedes." Knavs also made his own way to achieve wealth within communist Slovenia — not an easy thing to do. Friends of the family described Viktor as "boisterous and strong-willed." As for the paternal comparison, Melania is characteristically flattering. "They're both hardworking. They're both very smart and very capable. They grew up in totally different environments, but they have the same values, they have the same tradition. I myself am similar to my husband. Do you understand what I mean? So is my dad; he is a family man, he has tradition, he was hardworking. So is my husband," she said. Is Melania a real-life Claire Underwood? In an interview with GQ, Melania said "nobody will ever know" her political views because "that's between me and my husband." But according to Politico, these so-called secret political chats have had a major influence on how Donald runs his administration. Sources told the political blog that she has taken on the role of "private watchdog," actively scanning cable news and other outlets in order to keep her husband updated on how he's being perceived by the public. 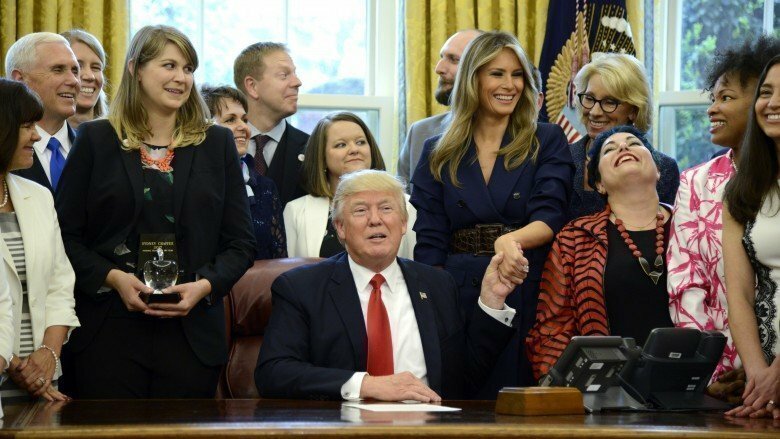 The first lady has also reportedly grown concerned about the constant leaks allegedly coming from White House staffers, leading some to believe she's instrumental in managing the president's inner circle. Longtime Trump aide Roger Stone told Politico, "She has excellent instincts into who is trying to exploit their influence with him." Considering all of the shake-ups that have occurred within the Trump administration's staff, rumors that Melania is a behind-the-scenes mastermind have us wondering if she's really the one who gets to say "You're fired." Almost no celebrity couple is immune to the occasional tabloid headline, but when Donald threw his hat into the ring for the presidency, the supermarket checkout was noticeably quiet about his marriage. According to Politico, this may have a lot to do with Donald's close relationship to AMI owner David Pecker, the man whose media empire owns the National Enquirer, the Globe, the National Examiner, and Radar Online. Trump and Pecker worked together in the '90s on Trump Style, "a magazine for guests of the Trump properties, when Pecker was a magazine executive at Hachette Filipacchi Magazines," and the two have remained close ever since, reported Politico. Throughout the 2016 presidential campaign, AMI's publications tended to be highly critical of Democratic presidential candidate Hillary Clinton and her husband, former president Bill Clinton, while simultaneously championing Trump and leaving Melania out of it altogether. This was purely coincidental, according to Pecker, who told the New York Post: "The pro-Trump and anti-Hillary covers have seen newsstand sales pop 23 percent. That is the only poll data that I care about." As this writing, celebrity gossip tabloid Us Weekly has also been purchased by Trump-friendly AMI, so whether or not you believe the stories printed in the scandal sheets about famous couples, it looks like even fairly innocuous headlines, like this one, could become a thing of the past. 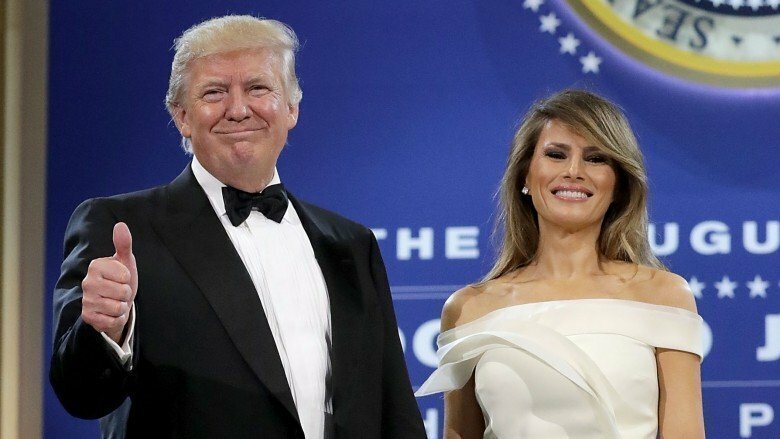 We've already covered POTUS and FLOTUS's strangely stiff appearance during the inauguration festivities, as well as several high-profile head-scratching moments regarding the nature of their intimacy since the election. And yet, it seems President Trump either wasn't paying attention or just can't help being awkward around his wife on the world stage. Case in point: the president's press conference in Ft. Myers, Fla. following Hurricane Irma. While standing directly next to his wife, he said, "I just want to thank everybody, the first responders, uh, on behalf of myself, our vice president. 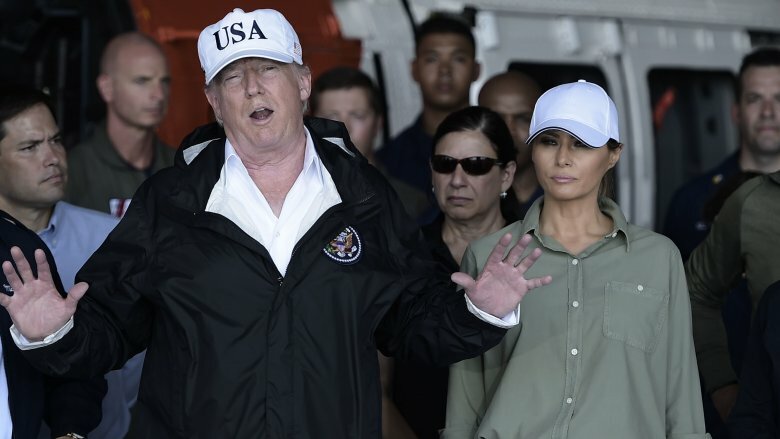 Melania really wanted to be with us, she's really, it's really touched her heart what's gone on, and we've seen the devastation. Uh, we're gonna see some more of it now unfortunately." 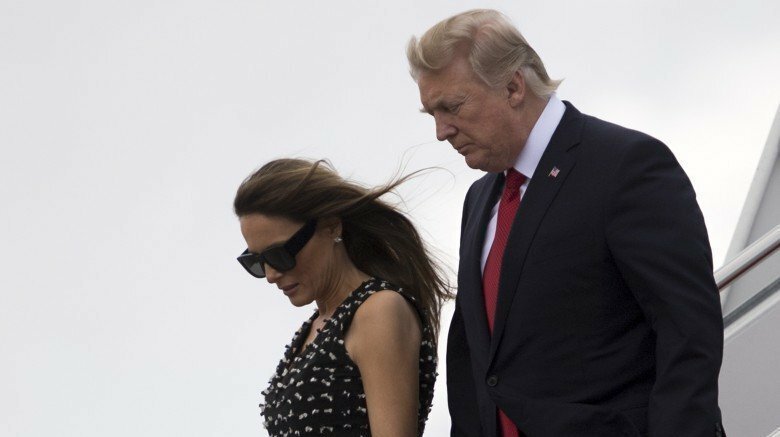 According to The Sun, Trump's attackers quickly jumped at the idea that he wasn't even aware that his wife was standing right beside him, while his defenders offered him the benefit of the doubt, saying he was likely just "saying that she felt strongly about making the trip with him," and that he is "just awkward with words." Either way, that could have made for a long, silent Air Force One ride back to the White House. According to a report in The Wall Street Journal (via The Cut), Trump's longtime personal lawyer, Michael Cohen, allegedly paid adult film star Stephanie Clifford (aka Stormy Daniels) "$130,000 as part of a nondisclosure agreement" in exchange for her silence regarding an alleged year-long affair she had with Trump in 2006. It should be noted right up front that Trump, his lawyer, and a written (but as yet unverified) statement from Daniels all deny the accusations of any such affair. 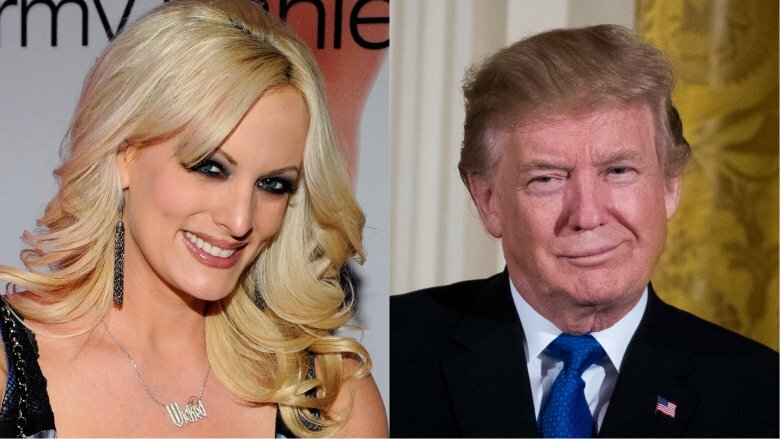 Complicating things further, Daniels had previously spoken to several media outlets about the alleged affair, before mysteriously falling off the radar in October 2016, when the payment was allegedly made. So, what's this got to do with the Trumps' marriage? Glad you asked. Trump and Daniels supposedly first met at a "celebrity golf tournament" in July 2006, which would have been eight months after Trump married Melania and four months after Barron was born, meaning if these accusations are true … no further commentary needed, right? The aforementioned Wall Street Journal report was published Jan. 12, 2018. Donald and Melania got hitched Jan. 22, 2005, meaning their 13th anniversary gift from the WSJ was a big old box of awkward. Perhaps not coincidentally, CNN reported that the big day "came and went with no tweets, no Instagrams, no mention of a private dinner on the President's schedule." But hey, maybe Donald and Melania just felt that flaunting their romance would look a bit conspicuous in light of the scandalous accusation. We bet they did it up big last year on their 12th anniversary. After all, they had another yuge reason to celebrate — Donald's inauguration — right? 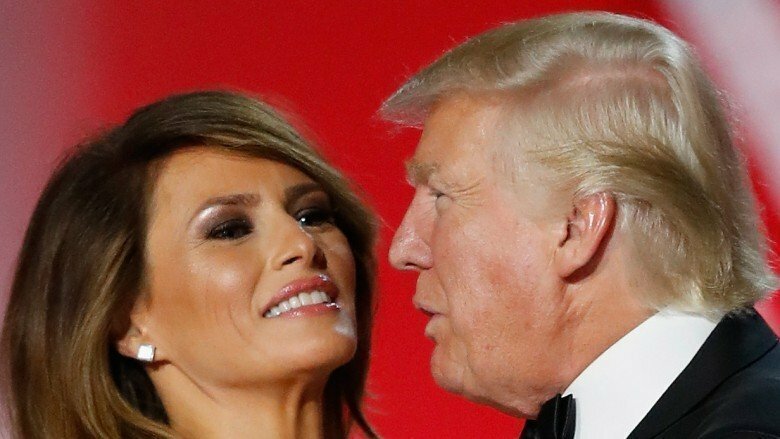 "The first couple did not celebrate their 12th anniversary together last year — the first lady returned to New York at the end of a jam-packed inaugural weekend," CNN also reported. Oh, alrighty then. Not only did the Trumps have a lowkey (and perhaps icy) anniversary in the wake of the Stormy Daniels story, they also sent up some marital red flags when Melania suddenly dropped out of a planned visit to Davos, Switzerland for the president's attendance at the World Economic Forum. In a statement to CNN, Melania's communications director cited "scheduling and logistical issues" as the reason for the first lady's change of plans. So what did Melania end up doing the day her husband landed in Davos? She went to the U.S. Holocaust Memorial Museum, according to People, which just so happens to be a 6-minute car ride, or 16-minute walk from the White House, according to Google Maps. We're not saying the whole "scheduling and logistical issues" thing was an excuse, but we are saying that we can't imagine rescheduling a visit to a local museum should have been that difficult. 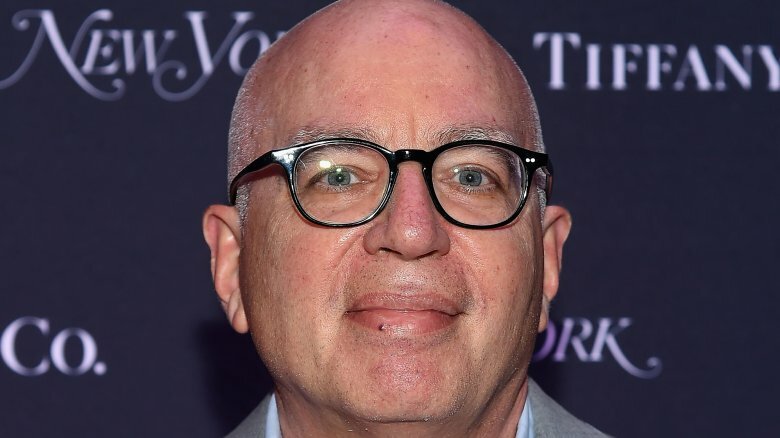 Michael Wolff's controversial book, Fire and Fury: Inside the Trump White House, ignited a firestorm of its own with alleged insider accounts of all kinds of turmoil within the executive branch, but Wolff told Real Time host Bill Maher that amid all the intense media scrutiny the book has received, the press has overlooked one of the slightly obscured but juiciest bits of dirt: allusion to an alleged affair Trump is currently having. Wolff said that although he is "absolutely sure" of the alleged infidelity, he couldn't include the accusation directly in his pages because he "didn't have the blue dress," which is, of course, a reference to a damning piece of evidence that implicated President Bill Clinton's affair with White House intern Monica Lewinsky. Granted, this is a salacious accusation by a man who's got everything to gain by keeping this gravy train rolling for as long as possible. That said, we're not too confident the Trumps' 14th anniversary is going to play out much different than the past few.